The Ecu 30watt 2200mah battery is quite the stunner, with two carbon fiver designs in a metallic grey and a rich, sparkly black. Your e cigarette will be dressed to impress. But besides just being a pretty face the Ecu 30watt is thicker in size than your standard ego battery giving it a profound battery life of 2200mAh, and keeping you vaping for days. The ECU 30 Watt has the ability to range from 7 watts to 30 watts giving you plenty of room for different clearomizer combinations. 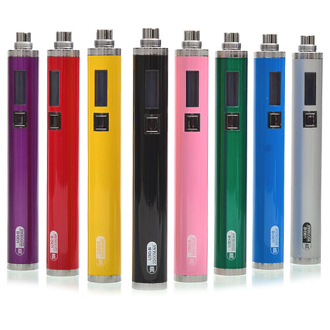 Because of its wider body, it gives a more streamlined look to some of your bigger clearomizers and atomizers. The ECU 30watt has also elimated all buttons except one. The square button located underneath the display screen is your power button and variable wattage adjuster. First click the button five times to turn it on (and eventually off). To adjust your wattage up you must click the button twice to see an arrow displayed on the screen. Once you see the arrow, you can either click the button several times to adjust up slowly, or hold the button down for it to scroll through the numbers faster. After five seconds the arrow will disappear and you are able to hold down the button to vape. To adjust your wattage down you must click the button three times to see an arrow displayed on the screen. Once you see the arrow, you can either click the button several times to adjust down slowly, or hold the button down for it to scroll through the numbers faster. After five seconds the arrow will disappear and you are able to hold down the button to vape.